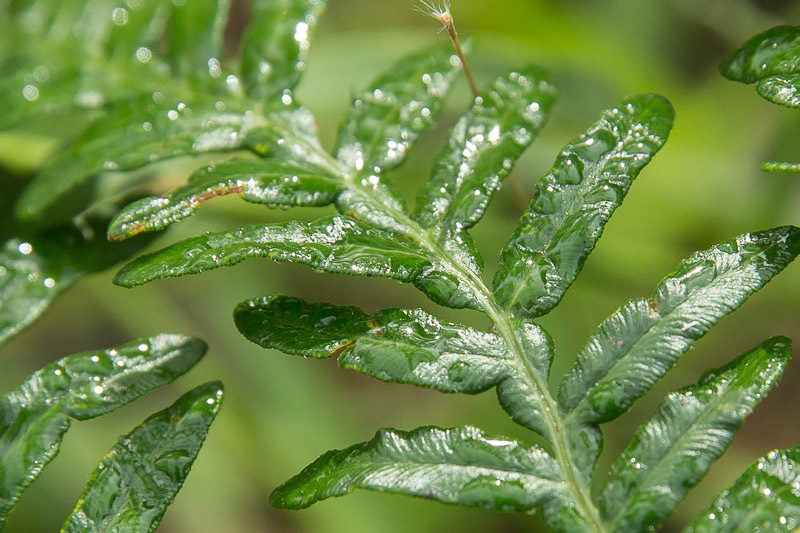 Early morning dew on the ferns down by the creek – Purgatory Creek. I’ve just spent another couple of days ‘glamping’ down beside another section of the creek. 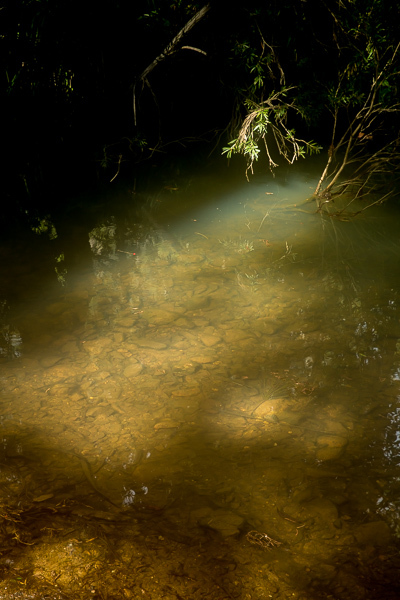 The creek runs for about a mile through my property with many different creek-scapes to explore, camping down there allows me to watch the light change the creek-scape throughout the day. A shaft of light through the deepening shadows caught a flash of green, down on Purgatory Creek again. 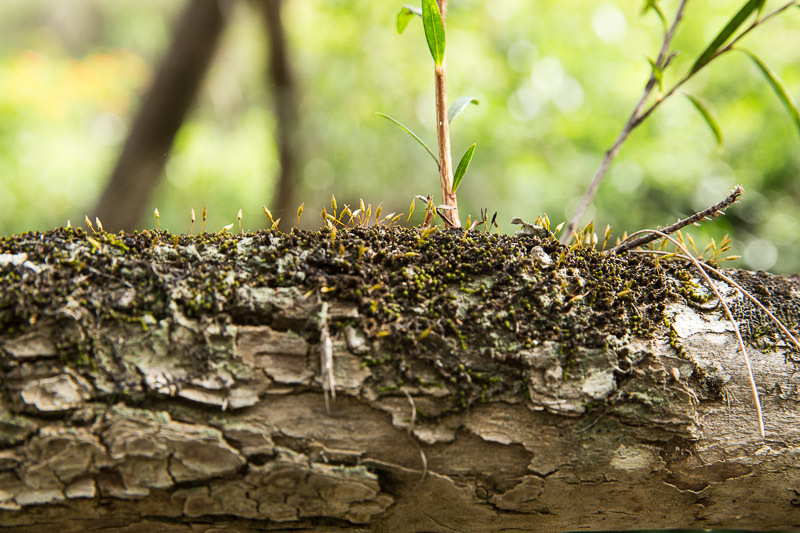 These small plants are growing on a branch hanging over Purgatory Creek. They are the seed heads of the moss and they are making their own world on a branch. Very tiny and you only see them if you stop and really look hard. 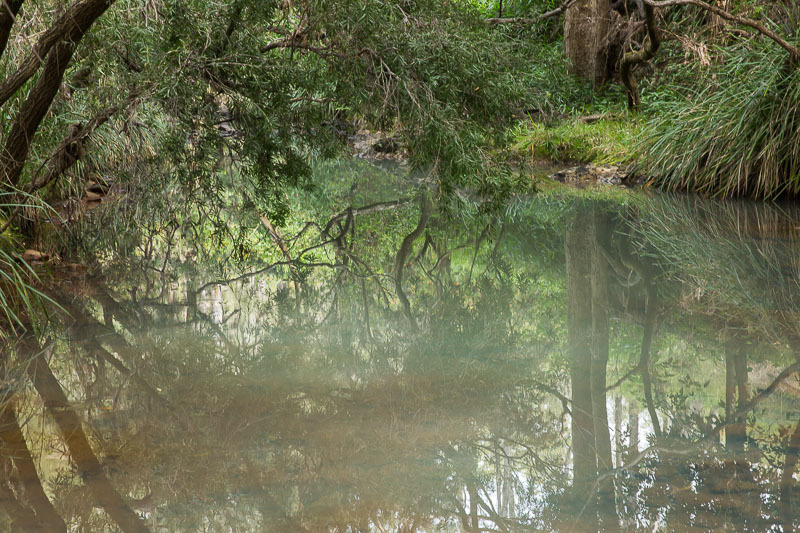 Beautiful reflections in the creek. I’ve finally got my replacement laptop and started putting all my photos onto it. So I’m a bit all over the place at the moment as I try and work out how to add old photos to a new Lightroom. 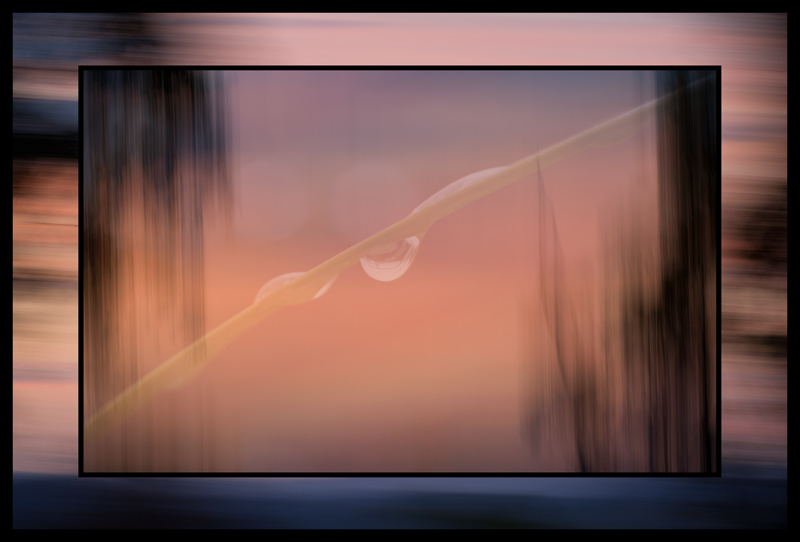 A few ideas and a few sunsets. 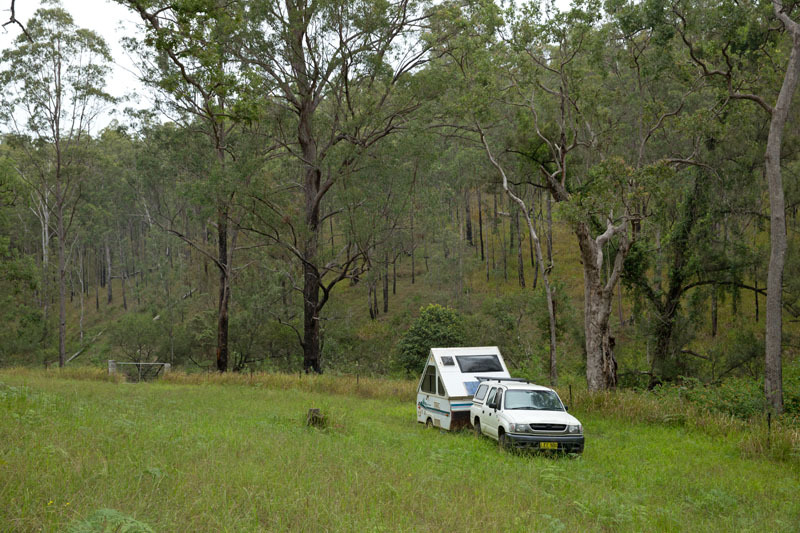 I took the little A’Van down to a section of Purgatory Creek for a few nights glamping (glamour camping). Spent some time in the creek, but the main reason was to get some much needed clearing of the fencelines done before the start of the next fire season. You can see how overgrown the fenceline is in this shot. After every flood the creek bed changes and with it the need to take more photos and explore again. An amazing red glowing sunrise yesterday and I missed the best of it. Bed was warm and comfortable but finally the message got through that I was missing something amazing. Captured shots in all the compass directions from home but oh, to have crawled out just 15 minutes earlier to get to a higher and clearer view. Will I never learn? 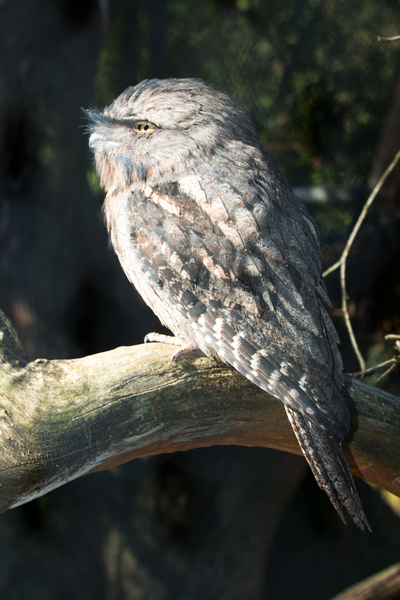 A Tawney Frogmouth Owl posing beautifully for me. Last shot of the day, just as we were packing up to leave this koala came into the clearing where we were and then started running across in front of us to get to the other side of the area. I captured a series of shots of this but all were out of focus 😦 These are the best I managed at the time. 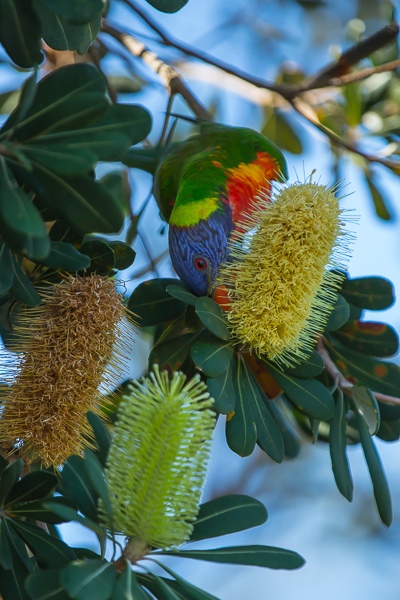 Normally koalas sit in the fork of a tree eating and sleeping. Very easy to take photos of there, when on the ground they can move very fast indeed.